Which coffee makers do top coffee professionals use at home? Some of the industry’s foremost experts in brewing coffee were right there at the conference. So I took out my voice recorder and started asking questions. Well, it turns out there is no simple answer to the question. In others words, the experts I talked to didn’t all point to the same brewing method as being the best. But there is one thing they did all agree on, without hesitation. If you are serious about brewing and enjoying the finer qualities of gourmet coffee, don’t use a single-serve brewer. The problem is that the coffee is not fresh. It is roasted and ground, put into K-Cups, capsules and so on, and then it sits in a warehouse, is shipped to stores, where it sits for even longer. By the time you get it home it is stale. So while one cup coffee makers may be super convenient, and you might enjoy some of the coffees you can brew with them, it’s not the best choice if you really want to get the best from a really quality coffee. If you want the best brew possible you need to buy whole beans and grind them at home just before you brew the coffee. 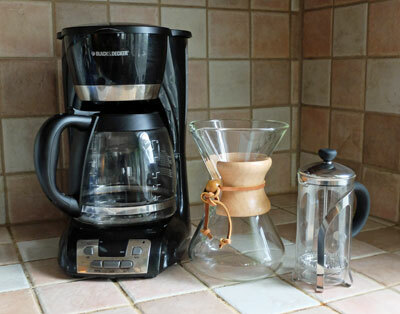 Let’s look at the coffee makers the real experts use at home. First I spoke with Oren Bloostein of Oren’s Daily Roast. Oren has been roasting, tasting and selling great coffee in New York for about 30 years. Oren’s choice? He brews his coffee with the Chemex pourover brewer. The Chemex is super trendy right now among baristas across the country, but Oren has been using it for decades. He likes it for the main part because of its thick paper filter and the control he has over the process. The paper filter takes out all the finer particles of coffee in the brew, leaving the final coffee 100% clear. For him, this means there are no coffee particles collecting on the inside of his mouth, so nothing gets in the way of his enjoying the full taste and flavor of the coffee. Next I asked George Howell who has been a leader in the specialty coffee business since the 1970s. His favorite is the Bonavita drip brewer. This is a quality brewer, costing less than many single-serve brewers, and makes a superb cup of coffee. Again, with the Bonavita you get to use a paper filter. In George’s mind, this simple drip brewer does the same job as the Chemex, but you don’t have to manually pour the water. Just add water and coffee to the machine and press Start. Among the experts at the conference they seemed to be divided between these two brewing methods. So when I got home I did a bit more research to see what other brewers top experts might use. Well, another popular method seems to be the press pot, otherwise known as the French press. Both Jim Reynolds, roastmaster emeritus at Peet’s Coffee and Tea, and Don Schoenholt, editor of Tea and Coffee Trade Journal, swear by the press pot. They like the fact that you get a tiny bit of sediment in the coffee and they feel the brew is bolder and richer as a result. So there you have it. If you want to brew a really, really good cup of coffee, your choice of brewers comes down to the Chemex, a quality drip brewer, or a press pot. As for which one is right for you, see if you can try them all and then make a personal choice based on your own taste and preferences. Among these three options it seems there is no wrong choice.